For the past 15 years, antiquated irrigation systems and a government conservation drive have kept many farmers from nutrient-rich Nile waters, forcing them to tap sewage-filled canals despite their proximity to the world's longest river. "This water ruins our pumps, it breaks our machines, it's bad for our production," Sharaf Al-Dein, 50, said of the canal. But even as Egypt wrestles with dwindling water from its only major source, the Nile, it pushes farmers to grow more to supply the country's costly subsidized food program. The two goals, farmers and experts say, are at odds with one another. And efforts to make the most of precious farmland have been hampered by decades of urban sprawl, which has accelerated since 2011 when the overthrow of President Hosni Mubarak led to a security vacuum. The government, anxious to stimulate economic recovery after years of political turmoil, wants to cut its $4.5 billion food import bill. Most of that bill goes to subsidies that guarantee universal access to bread at less than one U.S. cent (0.05 Egyptian pounds) per loaf. That makes Egypt the world's top wheat importer, purchasing around 10 million tonnes a year. "The problem of import dependence is going to get worse," said Nicholas Lodge, managing partner at Clarity, a Gulf-based agricultural investment firm. "You have population growth outstripping the ability of the agricultural sector to improve production, which is held back by land and water shortages." Egypt already grows a large amount, including 7 million tonnes of wheat a year according to traders, largely because Cairo offers farmers above-market prices to spur production. Subsidized bread encourages Egyptians to consume more wheat per person than almost any other country, and demand is set to increase as the 87 million population grows. The U.S. CIA World Factbook puts population growth at 1.6 million people a year. Egypt has an enduring debt to the Nile, which allowed it to build an ancient civilization based on agricultural wealth. But farms soak up 85 percent of the country's water, above global averages, according to think-tank the World Water Council. While improving yields and allocating more land to farmers could boost production, those measures will not keep up with growing demand, said Gamal Siam, an agricultural economist at Cairo University. Egypt's wheat yields are already among the highest in the world but further production is limited by growing competition between Egypt's farms and cities for limited land and water. The Nile Valley, almost the only arable land, makes up five percent of Egypt's area but is home to 95 percent of its people. Newly-elected President Abdel Fattah El-Sisi met with key ministers on Sunday to flesh out plans to reclaim 4 million feddans (about 1 billion hectares) of desert land for farming. Siam said the "unrealistic" plan would need 80 billion cubic meters of water a year, more than all Egypt's Nile waters. More modest reclamation plans in southern Egypt and on the northern coast have been stalled for years for lack of water. Policies like limiting farming of rice, the thirstiest crop, and encouraging sugar beets instead of water-intensive sugar cane have helped, but don't address wheat, the main water user. Experts say feasible solutions include overhauling irrigation systems or growing more profitable crops, such as fruits, which need little water but require complex logistics like refrigerated transport and storage. Water watchers warn that global food security is threatened by water scarcity, with Egypt especially affected by upstream Nile projects, a booming population, and climate change. "Egypt is basically a country that depends on one source of water, the Nile, which is shared by eleven countries," Benedito Braga, president of the World Water Council, told Reuters. "So from a strategic point of view the Nile is something of a national security issue for Egypt," Braga said. Treaties inked while all neighbors except Ethiopia were colonized grant Egypt three-quarters of the 74 billion cubic meters of annual usable flow, a position it is keen to protect. But with its regional hegemony faded, others along the river are starting to unlock the Nile's potential for themselves. In 2011, Ethiopia won its power-starved neighbors' support and began building Africa's largest hydro power project, causing consternation in Cairo. "All options are on the table," then-President Mohamed Morsi said on the dam last June. "If a single drop of the Nile is lost, our blood will be the alternative." Cairo has been more conciliatory of late, with Sisi to visit Ethiopia this summer for talks on the quarter-finished dam. Siam estimates the dam will hold back 10 billion cubic meters a year for seven years, with more lost to evaporation. Egypt says it needs its historical veto on Nile projects because upstream countries are more water-secure. 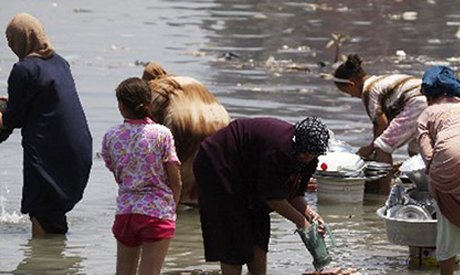 "Egypt is under the water poverty line of 1,000 cubic meters a year per capita, at 700 cubic meters," Siam said. "And with an increasing population, the problem becomes more serious." And whatever farmers such as Sharaf Al-Dein make of the climate change debate, some agencies are predicting shifts in weather patterns could affect Egypt. "A reduction in rainfall over northern Africa is very likely by the end of the 21st Century," the UN's Intergovernmental Panel on Climate Change warned in a 2013 report that also expected Egypt's temperature to rise by one to two degrees Celsius by the end of the century. Hotter weather means more water is lost to evaporation and less rain will decrease the Nile's overall flow, said Pasquale Steduto, head of the UN Food and Agriculture Organisation's Regional Water Scarcity Initiative. Taken together with the dam and demographics, it will be tougher than ever to feed Egyptians from Egyptian soil. "For thousands of years we've become used to overusing water, it was considered free. An Egyptian farmer will tell you, 'You don't own water. Water is from god,'" said Adel Beshai, economist at the American University in Cairo. "In the coming decade we will have to learn very fast to rationalize water use." As per London, New York, Paris and many other cities, perhaps the Egyptian Government should begin investigating the feasibility of reprocessing water from the sewage plants. There are millions of cubic metres of water literally going down the drain! It is the population explosion that is the root of all our problem. we are poisoning our resources and distant to vanish. It is nature way to get even. Depending on underground sources will lead to salt water Intrusion, sea water replacing fresh. This happened, for example, in the Florida Everglades as Miami expanded. I believed it also happens in Siwa now. Billions are now being spent to reverse grand water projects. At times, it is best to leave Mother Nature as she was created. Conservation, value added farming, infrastructure improvements, and population control are the answers. The problem is that we're a bunch of stupid people, to be honest. We do nothing about population growth. 90 million people living on 5% of the territory, meaning size of Belgium at best. What we do about that: the best Egyptian exercise: nothing. We produce stuff needing loads of water like cotton or rice. Yes, we, people lacking of water, produce rice. Rice that needs so much water you cant imagine of. We criticize Ethiopian dam, but what about our own dam? Loads of water lost in evaporation for what benefice? Land becoming sterile, no proper renewal of Nile's waters and we're still short of energy anyway. Basically from antiquity to now, we just went backward, we used to be greatest, smartest people on earth, priding ourselves in water management and savings, irrigation etc. We're just a bunch of fool now. God have mercy on us. There remains only one (and the last) question. What is bigger, the dimwittedness of Egypts political and religious leaders over decades or the universe?